This packaging has specially designed for this coming Mid Autumn Festival. As you can see it is a moon on the background. The launching was held at Goh Kaki Cafe, a cafe that will reminds you of your childhood, located at Bishop Street. There was reception counter ready for registration. Then it was taken over by Zurene, never thought that I could met her here. Then, it is the opening ceremony for this new designs of Gartien Pineapple Tarts New Packaging, Limited Edition! We also went through an interview session with all the in charge person on the spot. So this is the new design of Gartien Pineapple Tarts Packaging, looks cute isn't it? It is actually featuring civet cat, which you can see it is laying down on the tree and relaxingly having its food. Li Jynn and Gartien wish to pass message of all creatures on earth are also living peacefully and celebrating this special season with us. These fighting fishes are all over Goh Kaki, you guys can hop over sometimes and enjoy the nice ambience in this cafe. But please take note that parking is one of the biggest problem in this area. Look at all these lovely packaging! Don't you just feel like grabbing them home? I've tried the pineapple tarts, it is not too sweet. Furthermore it is perfectly baked, so it is not too hard, just chewy as it looks. I've had 3 in a shot so you definitely want to try this! Now you have another option for Mid Autumn Festival! Other than traditional moon cakes, snow skin moon cake or jelly moon cake, Gartien Pineapple Tarts could be another perfect option as a gift or for your own celebration of Mid Autumn Festival. Don't wait until the limited edition packaging finish! Quickly grab yourself a box of Gartien Pineapple Tarts asap! Below are the places where you can grab Gartien Pineapple Tarts! Address: 68 Lorong Macalister 10400 Penang, Malaysia. Remember the last fashion show I blogged about? It was Cosas United Fashion Show which happened at Gurney Plaza last month! One more good news for you! Cosas United is now opened in Gurney Paragon too! 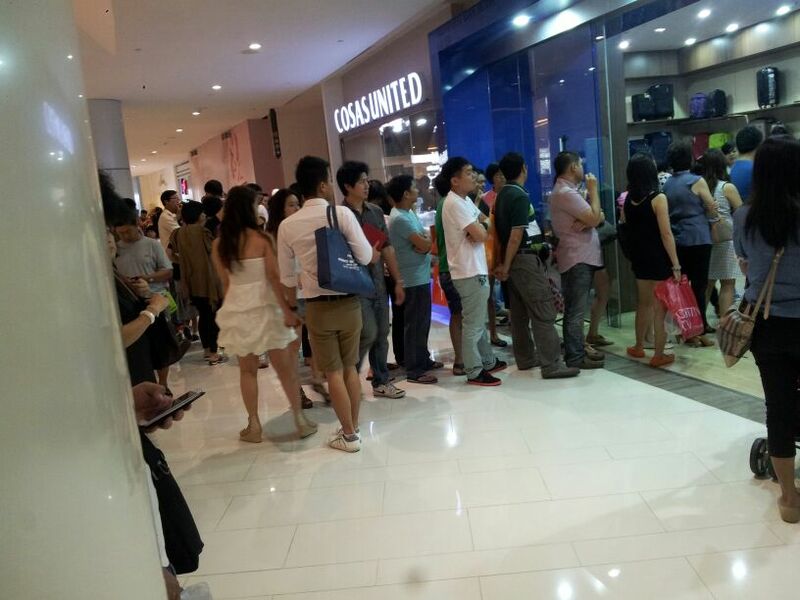 This is the crowd during their opening special sales! Here is something to focus on Cosas United! Cosas United provides Life Time Service for all their customers. If any customers have their products damaged, they can still bring over their luggages for replacement of spare parts. So get yourself armed before you travel overseas! 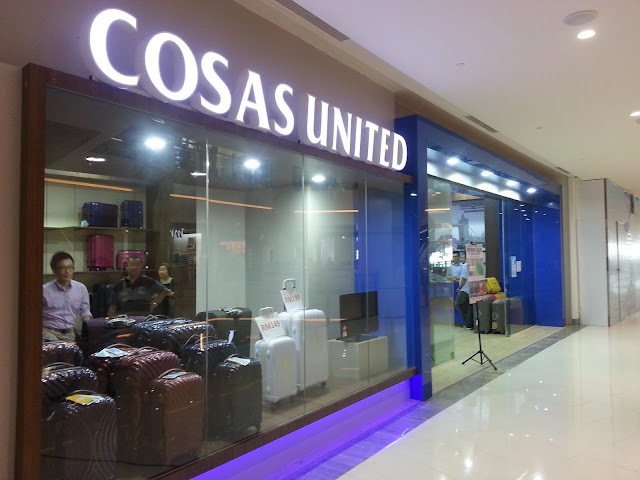 Hop over to Cosas United @ Gurney Paragon Mall now! Address: L4-19, Gurney Paragon Mall, Persiaran Gurney, 10250 Penang. McDonald's Samurai Chicken Burger and Taro Pie have invaded Malaysia! 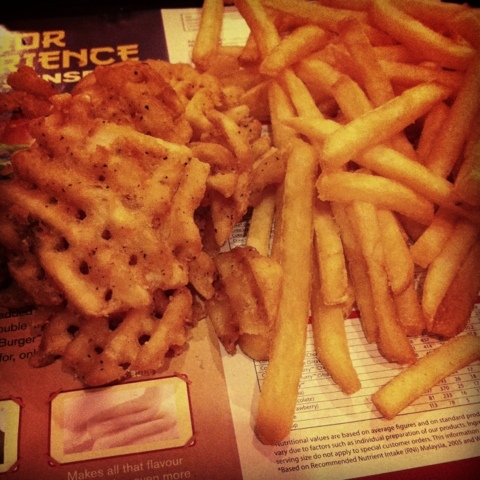 I'm not a fast food crazy person and I hardly have things like Mcd, KFC and stuffs. However, when they have new stuffs in their menu, I always go and give a try. This time it is Samurai Chicken Burger! I've been hearing that there are Samurai pork burger in Japan and Thailand. Which will never be available in Malaysia due to it is not halal. Samurai Beef Burger came into Malaysia for quite a while but since I don't take beef, so I still dont get to try. 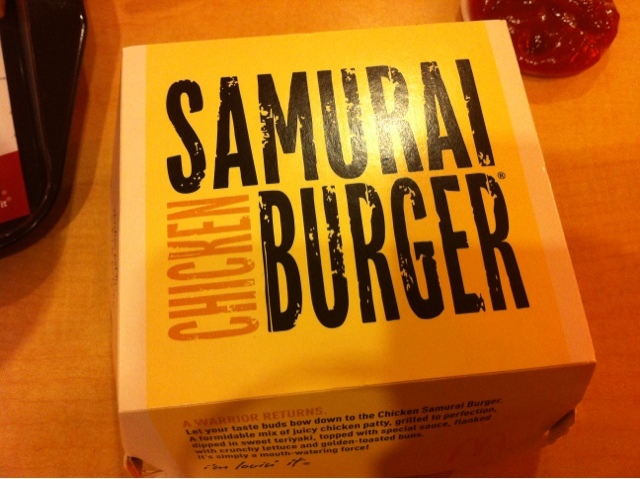 Finally Samurai CHICKEN Burger is here! It comes with criss cut fries and McFizz. It tasted quite nice though! 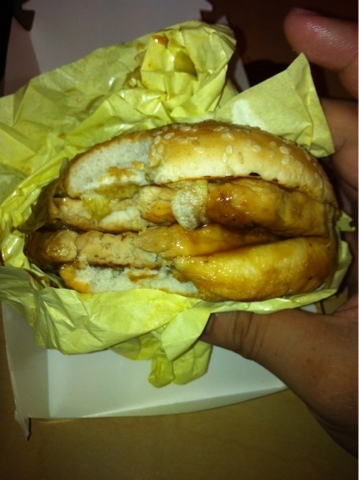 The patty is soft and juicy, though the sauce is a little bit too sweet for me. Unlike other burger, this is more moisture abd less oily because it is not fried patty. 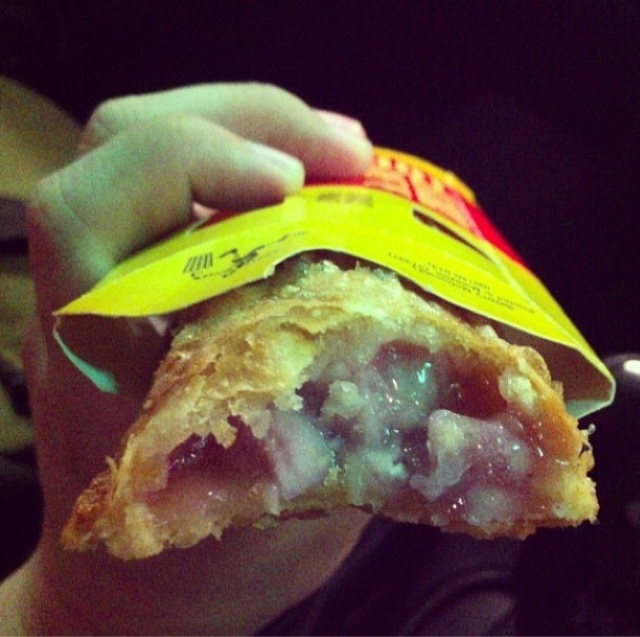 Taro Pie, the best pie I've ever had in Mcd! I am never a fan of banana pie nor apple pie, but this Taro Pie totally amazed me! 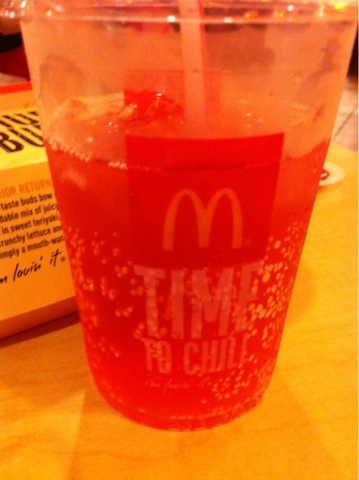 I wonder what will come next from MCD or KFC again. This post is updated with my iPhone 4. Sorry if something is wrong with the pics and everything. This is a post continue from my last post of Khun De Thai Restaurant. Previous post can be found at the link below. Let's get back to business, this post will be about all the main courses and some of them are the signature dishes of Khun De Thai. I think most of Thai restaurants will put up some famous people from Thai to show respects. I'm a tom yum fans, and this can be one of my favourite now. The sourness and sweetness is just perfect. Though it may be too spicy for me, but I'm someone who can't really take spicy. If you are a fan of spicy, then you have to try this! Or you may request for less spicy tom yum. I always love seafood cooking with salted egg. This is one milky way of cooking squid and I really like this dish. The squids are also fresh and chewy, that makes me really fell in love with this dish! Same like the white tom yum, it is priced at RM 19.00 for a pot of tom yum full with seafood. The ingredients they used are rather fresh. This red tom yum is not as spicy as the white one, which is quite perfect to me. It has got fish, squid and prawns inside this soup, and everything is fresh and tasty. The sauce is kinda thick but it is a little bit too salty to me. If you want me to choose in between the green curry and this, I will go for green curry instead. But the taste of this dish is rather different from ordinary curry chicken that you usually had out there. You may give it a try. This is one of my favourite dish in whichever Thai Restaurant.The price will be vary from sizes and types of fishes. Reason why I love this dish? It is extremely appetizing and you just can't stop once you have a taste of the sauce. But of course the fish must be fresh too! This dish is minced meat fried with basil leaves and some chilli. To be honest, the minced meat is too scattered and I would prefer if they can make it like a size of meatballs instead. This dish tasted kinda sweet to me. Though they have added chilli into the dish, but it is not spicy at all. Thai Green Curry is also one of my favourite Thai dish, especially when the soup is thick enough. I find that the chicken meat is too little for this bowl of curry but anyway the taste is rather satisfying as it is just nice, not too spicy nor too sweet. Paku is not something that you will usually find in Penang I guess. Unlike kangkung, Paku is rather crispy and it tasted kinda nice with sambal style. Anyway the sambal here is kinda spicy, you have to order this dish if you love spicy! I find this dish rather normal as they don't really stuffed a lot of seafood in there. As I don't really taste much of the Otak too. But one thing good about this dish is that it is not oily. One last thing that every body should do after meal! Khun De Thai do provide freeflow of icecream in here. Anyway I have choose Tropical Fruit flavour and favourite Yam flavour, both are good! it is quite hidden in Penang actually. I have been seeing friends checking in and taking pictures and the food really look good. So I've decided to give it a try on a fine Saturday weeks ago. I drove all the way heading to Botanic Garden, and carefully noticing my right side. It is located in a big food court, you may not see it directly unless if you drive into the carpark. This is the chef behind Big Ben Breakfast, look at how he handle all the stoves! There were quite a lot of people, I placed my order and waited for like 45minutes until my food arrive on my table. Avoid going on weekend if you are in a rush. So I ordered a cup orange juice since I don't know what to drink, but seriously? RM4.00 for a cup of orange juice?! Wouldn't it be too expensive for a hawker stall? Anyway, I would recommend this eatery to all my readers. Everything is good except for the long waiting time and expensive drinks. Address: Jalan Kebun Bunga, George Town, Penang 10350, Malaysia.